Equip the workplace with ROFAB tool balancers, high quality balancers for assembly and production. A practical tool attachment and a stepless setting make it easier to lift and maintain tools in the right position. We provide the balancers you need to create a good working environment in the industry or in the warehouse. Tool balancers from ROFAB is safe and easy to handle and is available without or with lock. Contact us and we will guide you in the selection of affordable and practical balance blocks for your business. Can be used for exhaust ducts, as well as balancing tools and controls etc, so that they "hover weightlessly" or pulled up to provide free work space. Available with progressive or constant power, as well as with lock function. Can be delivered with long extension length, up to 11 meters. The balancers is adapted to lift exhaust hose from the floor for free running and walking height below the hose. The balancers can also be used to lift hand tools, control doors, etc.. The blocks are made of glass fiber reinforced polyamide plastic. The wire, which is made of steel, has a standard length of 3 meters. Maximum extension length is 3.5 meters, and maximum holding power is 17 kg. Sustainability is progressive. The block can also be equipped with a lock function. Few parts provide very easy maintenance. The balancers is 99% recyclable. No order is too small, no order is too large, we deliver wherever you live. Delivery time normally 1-2 weeks. Also known as BR300, BRL300, BR350 BRL350. The balancer is adapted to lift exhaust hose from the floor for free running and walking height below the hose. The balancer can also be used to lift hand tools etc. Now we can also offer a variation on this balancer with extendable length up to 11 meters. 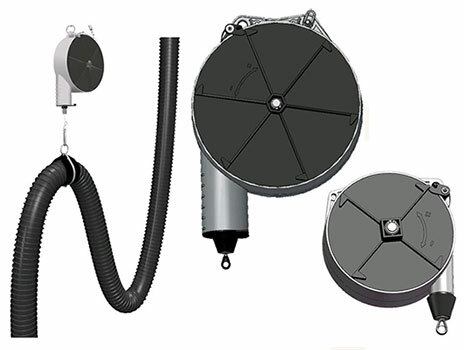 We can also supply "combi-balancer" where the locking device easily can be activated / deactivated. The balancers are made of glass fiber reinforced polyamide plastic. The wire made of steel has a length of 4.5 meters. Maximum holding power is 16 kg. The holding force is substantially constant throughout the length of the drawing. Is something "inverse progressive" for best function. The block can also be equipped with a lock function. Few parts provide very easy maintenance.